A variety of procedures where skin carrying hair follicles is removed from lower back of the head, the "donor area"- and transferred to thinning or balding areas. The most popular varieties are micrografting (1-2 hairs) and mini-grafting (3-8 hairs). A few surgeons selectively use round grafts which have 10-20- hairs each. 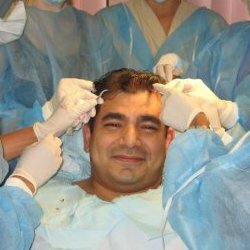 Dr. Larry Shapiro is a hair transplant surgeon serving SE Florida.